Bad Bacteria And How It Is Hurting Your Health - Eat. Lose. Gain. Probiotics are supplements that many people should consider taking. Probiotics contain live bacteria that can be taken to help balance the digestive tract. And before you start thinking that all bacteria is bad, realize that there is good bacteria and bad bacteria. Bad bacteria can cause inflammation and make you sick, all while running rampant throughout the digestive tract. What can stop these nasty bacteria from their reign of terror? The good bacteria found in things like fermented foods, but also found in probiotics. 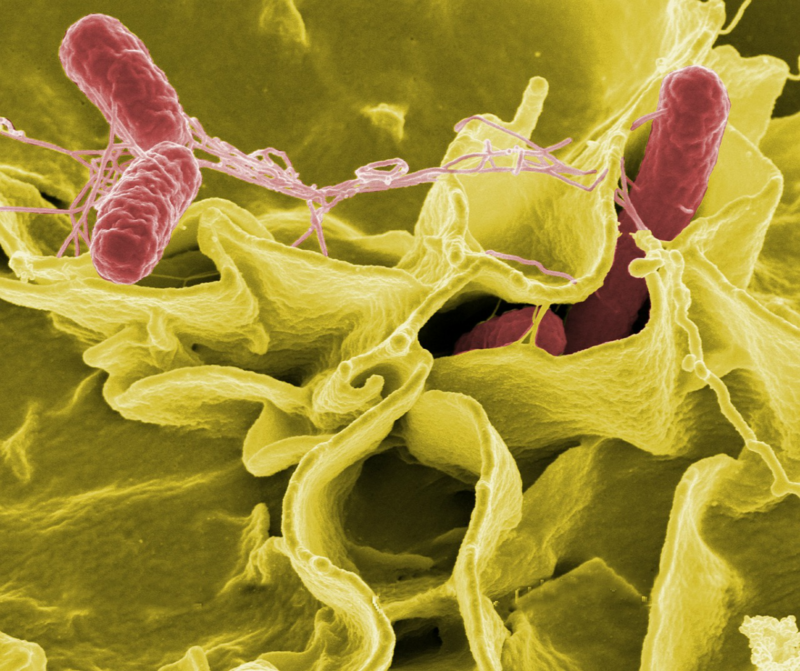 These friendly bacteria can take on the role of security guard within the digestive tract. They can stop the bad bacteria in their tracks, destroy them and return the digestive system to a place of order and balance. A bacterial imbalance in favor of bad bacteria can cause escalating problems in the digestive tract, creating a multitude of problems. Food may not be digested properly, creating a state of malnutrition. Blood can stop clotting correctly due to a lack of vitamin k.
There can be the development of Candida, a yeast overgrowth that is usually kept in check by the proper balance of beneficial bacteria. This yeast overgrowth can infiltrate the bloodstream and create a host of symptoms and side effects. The intestinal wall, which normally blocks harmful substances in the gut from entering the bloodstream, can become more permeable. When the gut becomes more permeable, substances escape into the bloodstream that should be blocked, leading to food sensitivities and inflammation. There can be digestive disorders like Crohn’s disease, IBS and ulcerative colitis. So, having the right amount of these bacteria is pretty important. There are reasons why someone might be high risk to have this type of bacterial imbalance. A strong risk factor is having taken multiple courses of antibiotics. This is because antibiotics kill off both the good and bad bacteria, and the bad bacteria can rebound quicker when the good bacteria is out of the way. Additionally, birth control pills can destroy good bacteria which will also compromise bacterial balance. Stress is another factor that can contribute to lousy levels of good bacteria. A processed, sugar filled diet is another factor. So a modern lifestyle makes it easy for a bacterial imbalance to occur. Now you might be wondering, what are the tangible symptoms of a bacterial imbalance run amok? Probiotics contain friendly bacteria in a pill form. If you don’t have any symptoms of a bacterial imbalance, probiotics may be helpful in stopping a growing imbalance from transitioning into a disease in the body. If you’re exhibiting side effects, there’s probably some work beyond supplementation needed to start healing. But supplementation can still be a good place to start. Some of the most common strains of bacteria you’ll find are Lactobacillus and Bifidobacterium. For someone who has never supplemented with bacteria, a good place to start would be around 1 billion to 2 billion CFUs, though many find benefit in building to a much higher dose. Most people tolerate probiotics quite well, but, of course, everyone is different. One of the most common side effects is gas and bloating which usually subsides after a week or two as the body adjusts. That is why it is better to start low and increase as needed to ascertain how well you tolerate supplementation. It is also best to purchase probiotic supplements from the refrigerated section. Beneficial bacteria are heat sensitive and are often destroyed as the temperature rises. So the only way to maintain supplement potency is to keep it cool. And pills that are currently sitting on store shelves may have been sitting in hot stockrooms for months. And one more thing. I bet you’re wondering if you can just skip the pill and eat fermented foods. That might be fine depending on the level of bacterial supplementation you need and how much fermented food you eat. Examples of fermented foods are miso, sauerkraut, tempeh, kefir and yogurt. The average store bought cup of yogurt has 60 CFU of bacteria. Kefir can have up to a billion. Sauerkraut can have about a billion cfu as well. So food sources might be appropriate when bacterial needs are low. For many of us, we need more on a daily basis than a normal portion of fermented food may provide. And in many cultures, the most commonly consumed fermented food, yogurt, can become irritating of consumed on a daily basis due to milk intolerance. Probiotics aren’t right for everyone, but they are a good option for many. Have you ever tried supplementing with probiotics? Do you eat fermented foods? I would love to hear your story! Gosh, that is amazing when western medicine jumps on board! I’ll look into doing a post about the different probiotic brands. Until then, as I mentioned, you want to look in the refrigerated section when choosing a probiotic, which does narrow down your choices. Erica, for the longest time I thought probiotics was just another fad – you know like the excessive use of vitamins was a while back. I have since stopped thinking that but this post has made me realize that they’re actually very important. I have a wonderful health food store in our area and will be checking it for the best probiotic supplement. Your suggestion to start small and build up is a good one – if you do have a problem with it, it probably won’t be to severe. Yes, you definitely want to start small. I take a pretty high dose and I’m fine, but you don’t want to start that high. It would make some people feel sick to their stomaches. Way more than I ever expected to know about bacteria. Appreciate the lesson, as always. Haha, Ken. Well, now you know! No, I do not take probiotics. I also enjoy eating yoghurt – I always have done. I seem to have a slight intolerance to spicy foods. I did not have this issue in my teens/twenties. It is time to investigate……. Really interesting Erica. I do eat some of the foods you mentioned, and developed a taste for Kim Chee on my trips to Korea – does that count? I’d like to echo Jacqueline’s suggestion about doing a post on brands. I see the benefits, but I know I would not invest the time or resources experimenting. kim chee is a good one. I believe it used to be pretty rare in the U.S., but thanks to higher-end and specialty stores, we now have access to it. I told Jacqueline that I will definitely look into a post about the different brands! Thanks to both of you for the idea. Thank you for this useful post Erica… I definitely need to share it! Meredith, thank you so much for letting me know that you connected with my acne story. After everything I’ve personally been through as well as after learning what I did in school, I fully believe that most long-term acne problems are rooted in the gut. We might have temporary flare-ups do to hormonal fluctuations, but if the problem persists, then the gut is the next place to look. We have something called Enterprise. It means looking at the overall process of the system and its interactions instead of looking of at one particular software. We need to look at our bodies the same way. We must understand, that one thing, digestion effects the entire body, not just our stomachs. What we eat or drink will affect the entire body. Doctors seem to treat ailments, not the cause of the illness. I agree, Wiliam. While western medicine has allowed us to make some amazing strides in healthcare, it overlooks how the body is connected. The disease is treated on a local level without looking into the real internal root of the problem. I think there are more and more physicians going through school these days who have an interest in both eastern and western medicine. I think, with more doctors like that, patients will receive much more comprehensive health care down the line. At least, I hope that is the case. I’ve been wondering about probiotics. I have a friend whose whole family takes something like a gummy form. I definitely will be looking forward to your article on brands. Hmmm, I would say a gummy probiotic doesn’t have much potency. I know that gummy vitamins are increasing in popularity with, not just children, but also adults. You’ve made me think that, besides just doing a blog on probiotic brands, I need to do another one for purchasing vitamins in general! My family and I have been using a combo of vitamins and probiotics in our diet, and it’s been really helpful in keeping us stay healthy especially now that the rainy season has hit us here in my country. It’s been lessening the need for us to take any synthetic meds. That is so great to hear, Adele! I’m glad they’ve been working for you.